NGC 7497 is an edge on galaxy located at a distance of 59 million light years. In this astrophoto, the galaxy is seemingly surrounded by beautiful faint nebulosity. As it happens, the nebulae is actually about 60,000 times closer to us, located in the outer reaches of our own Milky Way Galaxy. 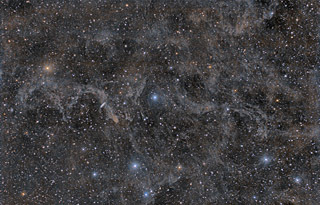 The nebulosity shown in this image is part of MBM 54. MBM 54 is located about 900 light years from our solar system in the outer regions of our galaxy. This type of molecular clouds are found at high galactic latitudes (parts of the sky away from the plane of our Milky Way Galaxy). 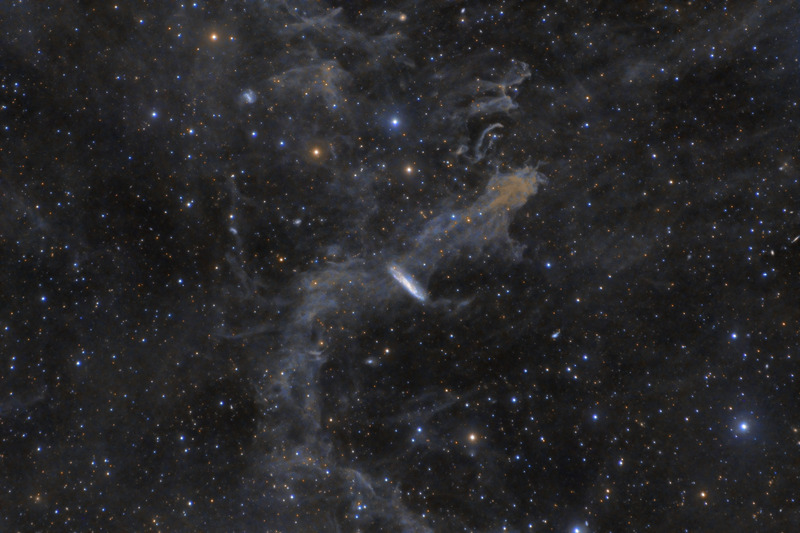 They are often referred to as galactic cirrus clouds or more commonly "Integrated Flux Nebulae" (IFN). These clouds are very faint and quite tricky to photograph. The IFN was first discovered in 1984 by the IRAS infrared satellite. In 1985, astronomers Magnani, Blitz and Mundy surveyed the IFN and developed their MBM catalog of 56 high galactic latitude molecular clouds. MBM 54 is one of the closer of these IFN clouds. Software Used Images Plus 6.0 for camera control, Images Plus 6.5 for calibration, stacking, ArcSinH stretching, adaptive Lucy-Richardson deconvolution, star size reduction, edge masking, masked stretching, and selective color mask generation. Photoshop CS5 used for levels and curves, lab color, saturation adjustments, selective color, match color, high pass filter, and stack blending. Gradient Xterminator for gradient removal. Carboni Tools for additional noise reduction and smoothing. HLVG for additional color correction. Registar 64 for subexposure alignment. Focus Magic for focus restoration. Notes I always enjoy imaging IFN clouds, as they present quite a challenge. I'm overall pretty pleased with this image, although I had some slight problems with the registration of my color channels (mostly visible on close inspection). I tried some very aggressive masked stretching while processing this image. Although I ended up with some slight softness, overall I think the balance between noise and smoothness is pretty good. I'm mostly happy that I was able to retain some good details within the subtle nebulosity. This image was also published in the Readers' Gallery section (p.72) of the April 2017 issue of Astronomy Magazine!